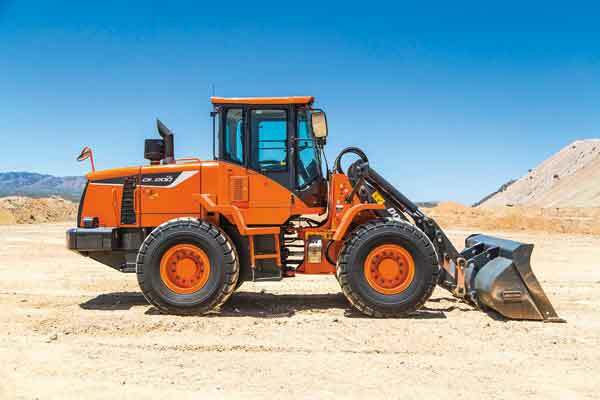 The new DL200-5 and DL200TC-5 (tool carrier) are the first Doosan wheel loaders with a hydrostatic drive system — in place of the traditional torque converter transmission. Like their predecessors, customers can choose between two lift-arm designs. The 142-net-horsepower DL200-5 wheel loader is built with a standard Z-bar lift-arm linkage system, which is ideal for digging, heavy lifting and general construction tasks. The DL200TC-5 wheel loader has a parallel-lift-linkage system to help the wheel loader operator keep the load level through the entire lift cycle. Both the DL200-5 and DL200TC-5 have a 2.6 cubic-yard bucket capacity. Doosan DL200-5 and DL200TC-5 wheel loader operators can easily adjust traction force to match jobsite conditions to reduce wheel slippage for a more efficient operation in digging, stockpiling and loading applications. Operators may choose from the following traction modes. •	Max: Provides maximum traction force •	Traction control: Allows the wheel loader operator to choose from three levels of reduced traction forces to match jobsite conditions •	S-Mode: Helps when operating on slippery roadway conditions Wheel loader operators may instantly return to the machine’s Max traction mode by pressing the kick-down button on the joystick control. 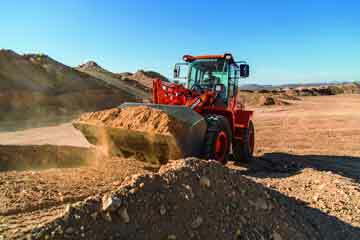 New Doosan DL200-5 and DL200TC-5 wheel loaders are powered by Tier 4-compliant diesel engines. Doosan achieved Tier 4 emission requirements without the need for a diesel particulate filter (DPF). The wheel loaders’ diesel engines are optimized for use with a high-pressure common-rail (HPCR) fuel delivery system and a cooled exhaust gas recirculation (CEGR) system. New to the DL200-5 and DL200TC-5 is a wastegate turbocharger (WGT) and selective catalytic reduction (SCR) with diesel exhaust fluid (DEF). The wastegate turbocharger utilizes a diesel oxidation catalyst (DOC) to reduce particulate matter (PM) and SCR aftertreatment to reduce nitrogen oxides (NOx).